A traumatic brain injury (TBI) results when there is substantial trauma to the head. 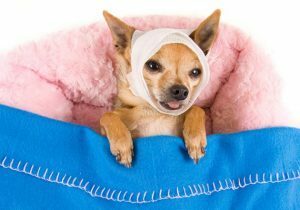 Dogs and cats can sustain injuries to the brain when they are hit by a car, attacked and bitten around the head by a larger animal or shaken by a larger animal or when they fall from a height, receive a gunshot wound or suffer blunt force trauma of some kind. Fortunately, the bony skull and the large amount of muscle mass that is normally present in dogs and cats provide (some) protection for the brain. Head trauma is a medical emergency. If any significant head trauma is witnessed, a veterinarian should examine your pet immediately. The consulting veterinarian will first evaluate breathing and cardiovascular function. Your veterinarian will administer intravenous fluids (IV) to treat shock and stabilize blood pressure. Oxygen supplementation is often provided for the first few hours after a head injury. Once breathing and blood pressure are stable, the veterinarian will perform a careful neurological examination to assess for signs of TBI. Symptoms of TBI may include loss of consciousness, seizures, weakness in the legs or pinpoint pupils. If symptoms of TBI are identified, the veterinarian will usually administer medication to help control swelling of the brain and decrease intracranial pressure. Other medications may be administered to treat infections or to address pain, nausea or seizures. If clinical signs of TBI are present, the veterinarian will likely recommend admission to the hospital for close monitoring and intensive care. In patients with severe or worsening neurological symptoms, referral to a neurologist for a CT scan and further treatment will be recommended.